Yesterday I decided to make Pretzel Bread. I had never made this before, but I got inspired by a friend’s Facebook post of his adorable son munching on some pretzel bread at a restaurant. Yep, that’s all it took for me to find a recipe and try to make it myself, and I am so glad I did. This bread is so delicious. It is firm on the outside and chewy and soft on the inside. I even decided to use two of the larger buns to make Philly Cheese steak sandwiches for dinner, and it worked out really well. Combine the water, yeast, and sugar in a cup, cover, and let sit for 5 - 10 minutes. In a large bowl, combine the flour, and salt. Add the yeast mixture and melted butter to the flour mixture. Stir together until a dough forms, then knead on a surface for 5 - 10 minutes or until smooth. Place in a greased bowl, cover, and let rise for at least 1 hour or until double. 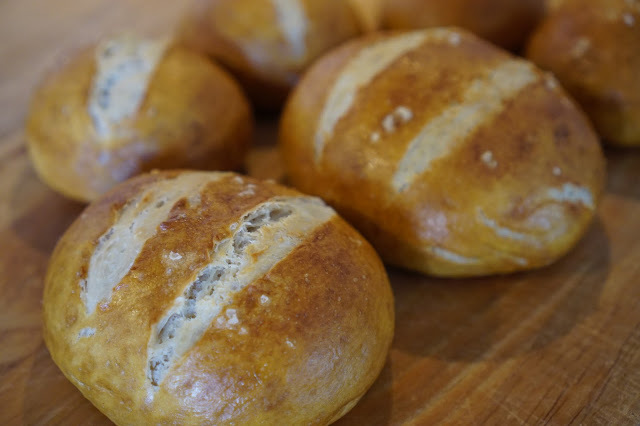 Divide the dough into 8 if you are making large buns or 16 if you are making small rolls. Roll each dough into a ball by pinching the bottom of the dough and turning it, then lightly coat it with flour, and place on a baking sheet lined with baking paper. Cover the balls of dough with a kitchen towel, and let rise for 30 minutes. Meanwhile bring a pot of water (2 quarts) to almost boiling, lower the heat to medium, and add in the baking soda. Stir it altogether. Then, place a ball of dough in the pot (pinched side/bottom side down), and let it sit for 30 seconds. Then, carefully flip it over and let the other side sit for an additional 30 seconds. Place the dough back on the baking sheet (bottom side/pinched side down). Repeat this until all the balls of dough have been in the warm water. You can do two at a time or more if you want, depending on the size of your pot. Brush the tops of the dough with a beaten egg, and then sprinkle a bit of salt on top of each bun. Take a sharp knife and make a slit on the top of the dough. I put two on the larger buns and one on the smaller rolls. This just makes them look nicer, so it's optional. Bake them in a pre-heated oven set to 425F/218C for 15 - 20 minutes. That’s it. Hope you like this recipe. I’m not sure how to get the bread darker in color, maybe the water needed to be a little warmer or the buns needed to be in the water for a slightly longer time, but regardless the flavor and texture of the bread buns were really good.